The highland valley of Kapatagan in Davao del Sur has recently become one of the most popular outdoor adventure destinations because of the many unique wonders and delightful sights to see and experience - a truly different kind of adventure anyone can enjoy; a perfect quiet respite from the noise of city life. Blessed with lush greenery, the entire valley is rich with a variety of flora and fauna, towering forest trees and stately pine trees set in a landscape of wild grass and vegetation. 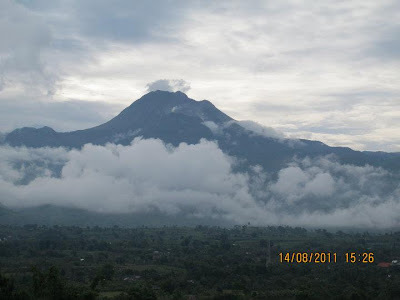 Occasionally, Kapatagan is fully covered with a pleasant mixture of cool mountain mist and hoovering thick fog particularly in the early morning of the day and in the evening. Kapatagan is just one of the barangays of Digos City, with an estimated population of at least 8,000 inhabitants whose primary livelihood is vegetable cultivation, Tilapia breeding, coffee farming and recently, tourism. 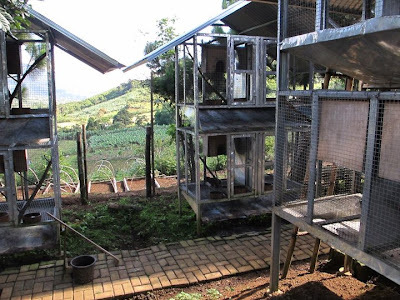 It is home to a number of flora and fauna species endemic to Mindanao and also to the King of the Philippine Skies, the great Philippine Eagle. Its close proximity to Mount Apo, the Philippines' highest mountain peak, makes it one of the major jump of points for mountain climbers preparing to scale the dormant volcano. 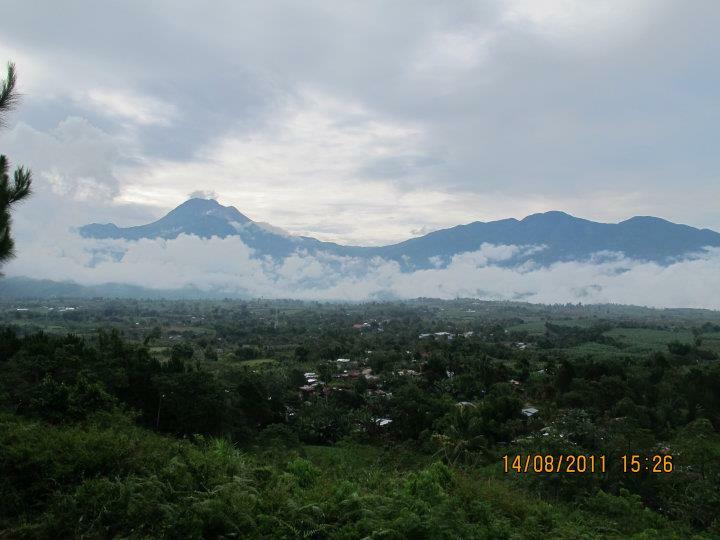 The breathtaking view of Mount Apo from Kapatagan has been the subject of many photographers and countless articles in newspapers and magazine both locally and internationally. Within the wide expanse of Kapatagan is a natural pool of waters called, Lake Rosario. The lake used to be the main water source of Kapatagan, but in view of the ever increasing population, residents have started to breed freshwater fish such as Tilapia. For those who are adventurous and love the outdoors, there are a number of popular destinations in Kapatagan which in recent years have brought much tourism and economy in Davao del Sur. These are: Mount Apo, Camp Sabros, Mount Apo Highland Resort (now called Camp@tagan Lake Mirror and Hillside), Kublai Art Garden, a Tibolo Village, and the famous Virgin Falls. 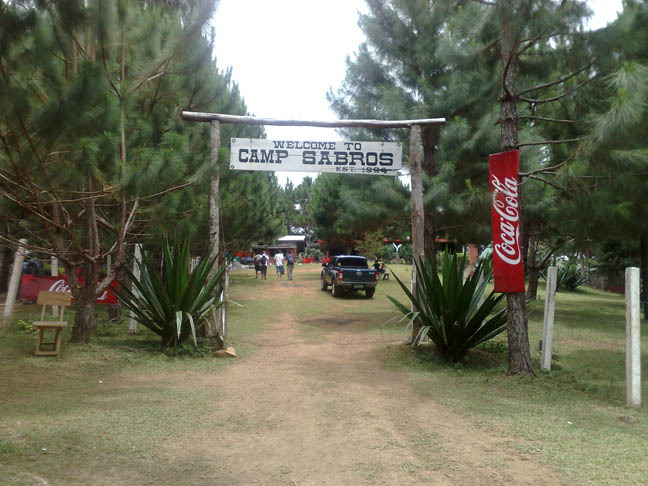 Camp Sabros is an outdoor adventure camp situated 3,980 feet above sea level on the cool highlands of Sitio Barras in Kapatagan. Opened to the public in December 25, 2007, it boasts of two long 380 and 400 meters zip lines called "Slide for Life" at 180 feet above the ground, roughly the height of a five-story building. 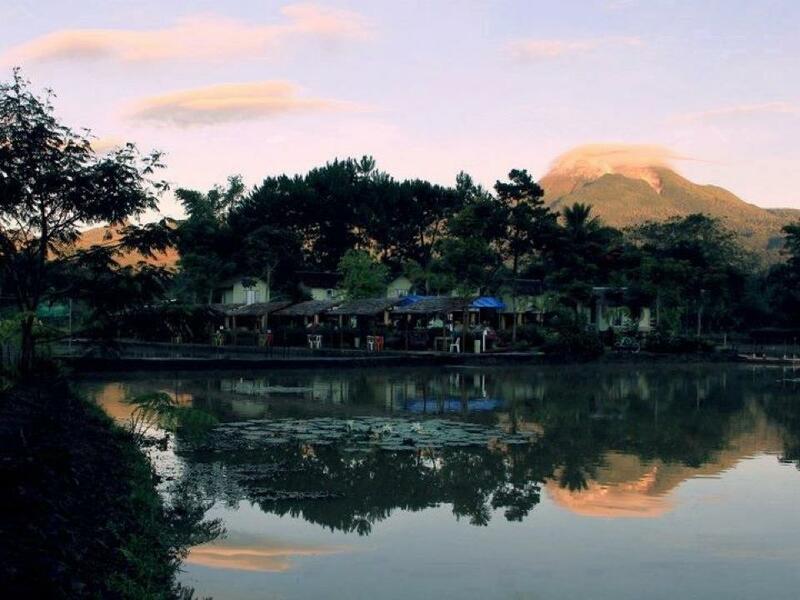 The camp is surrounded by lush greenery of tall pine trees all across its landscape, and offers a relaxing view of Mount Apo and the surrounding mountain ranges. Its high elevation makes the weather in Camp Sabros cool all year round. expensive coffee, the Civet Coffee. 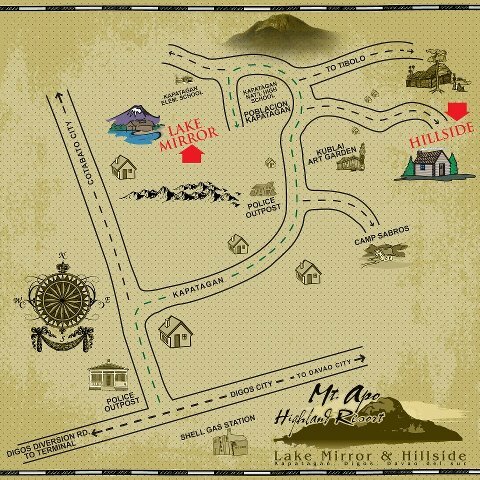 Mount Apo Highland Resort, now called Camp@Tagan Lake Mirror and Hillside, is situated in the uphill portion of Kapatagan. It is a two-part mountain resort complex: Lake Mirror which is set against a cold spring pool; and a campsite perched in a hilltop called Hillside, hence where the Resort got its name. Moreover, there are Asian Palm Civets (Paradoxurus hermaphroditus) bred in captivity that produces for them the world's most expensive coffee, the Civet Coffee. 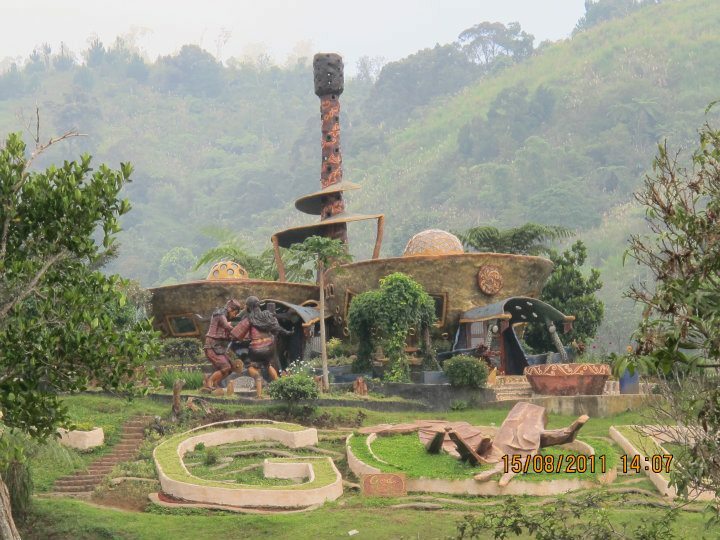 Kublai Art Garden is definitely a place to visit, a jaw dropping experience guaranteed! Mindanaoan artist, Kublai Millan turned the entire place into one huge canvas filled with his artworks of various sculptures and art pieces perched in a landscape of lush Korean grass with Mount Apo and surrounding mountain range as the backdrop. A must-see in Kapatagan. A Bagobo plating their famous Nilutlot in a platter of Banana leaves. Located at the foot of Mount Apo and about five kilometers from Hillside is the Tibolo Village, a truly Mindanaoan tribal village that showcases the Bagobo culture at its best where visitors can spend the day and immerse with the community. Here, visitors will get to meet and interact with the Bagobos and learn their culture, take a peek of their houses, learn their traditional craft, and taste their famous "Nilutlot" cooked in bamboo, and many more. 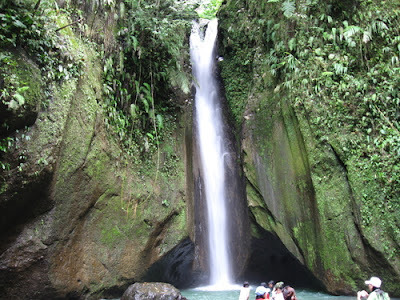 And deeply hidden within the highlands of Kapatagan Valley is another wonder of nature to behold called, the Virgin Falls - a one tiered waterfalls about 20 meters high and some 10 to 15 feet wide of cascading waterfalls bordered between huge rock walls on each side surrounded with lush flora and fauna. Its natural pool of icy cold, crystal clear waters at the basin is too inviting to ignore. For those who love nature and the outdoors, Kapatagan is the perfect adventure. Mount Apo Highland Resort offers day tours to Kublai Art Garden and the Tibolo Village. Hi Kim Gerald Repito, no doubt that the entire Davao Region is full of wonderful yet to be discovered and developed destination into a major Philippine tourist attraction. It is for this very reason that Amazing Davao was created as my share of campaign to all to take a closer look to the many amazing unique wonders and sights of the city with particular emphasis to its benevolent leadership in governance and, equally important, the Davaoenos who lovingly support it. I was born in Digos City, but I never been this place yet so beautiful. I'm going this year me, I know how many hours to go there from Digos City?. I like to stay one night is there's hotel for the visitors. im happy hearing and reading the stories of people who have gone there in kapatagan..by the way im from davao del sur..and hopefully im one of those people sharing their experiences very soon.. I love the scenery! I'd love to visit the place. What a view! I want to spend my vacation in that place. This is one of the greatest view I've ever seen. hmmmmm. kapatagan is my life.. im born in here, i grown up in here, im living in here... this is my home and im here for a lifetime. I really love this kind of place. Someday I want to go and have a vacation there. I'd like to go there with my friends. Very soon!